I think I may have come up with something that could be really cool. So I am going to be running E85 in my car eventually (likely within the next month), and I was thinking about how to possibly make an automatic map changer based on the ethanol content. The ethanol sensor (hereafter referred to as ES) used on the factory cars outputs a PWM signal that tells how much ethanol content the fuel has and the fuel temperature. The frequency indicates ethanol percentage, such that 50hz=0% ethanol, 150hz=100% Ethanol, and +1hz=+1% eth. The pulse width determines fuel temp such that 1 millisecond = -40*F and 5 milliseconds = 257*F. Both are linear. 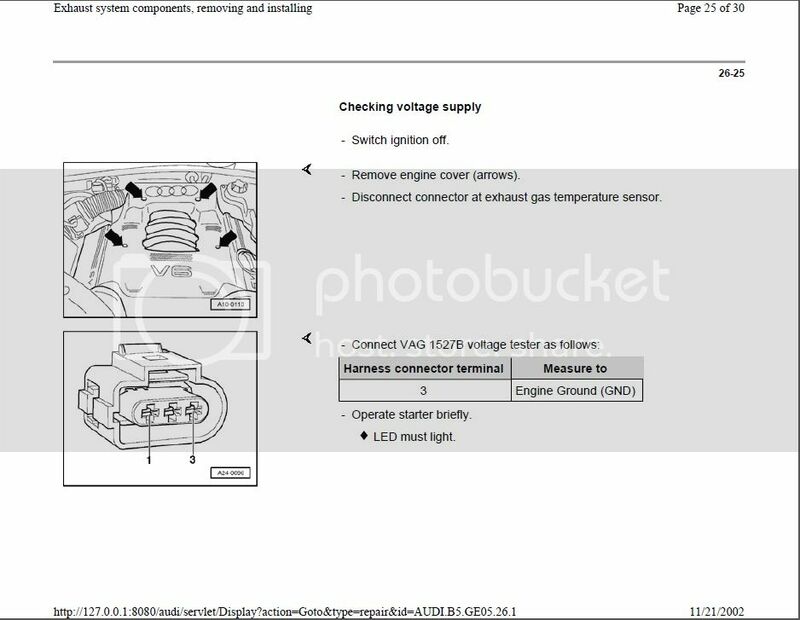 This got me wondering if the circuity in the plastic EGT box at the connector figures out the pulse width and period, and outputs those via two separate wires, or if the PWM signal goes straight to the ECU and the ECU figures out the pulse width and period itself, and assigns those values to tcchats and tccpats. Anyone know where the calculation of the pulse width and period take place? The EGT sensor has 3 wires connecting it (see pic below). Pin 3 is ground, does anyone know off the top of their head what the other two wires are (I have yet to look at the wiring schematic)? If we know that one of the other two is a power wire, then we know that the odd-man-out is the PWM signal to tap into. If we get TCCPATS_W reading in the value from the ethanol content sensor, we could possibly write a routine similar to the map switching method used in the other thread, but instead of switching the map via the cruise-control stalk (or whatever), it is decided by a variable that is dependent on the PWM frequency from the ethanol sensor. We could make a map that is setup something like, frequency 0-110 hz (which is 60% ethanol), use map 1, 110-130 hz (80%) use map 2, 130-150hz, use map 3. And with it set up like this, TCCHATS is a variable that one can log to log the fuel temperature. Another method that I could do (since I already have the Zeitronix ethanol content analyzer gauge) is to use the analog linear 0-5V output from the Zeitronix ECA gauge to input into the secondary cats input, and have the map switching table be based on those voltages. Obviously there would need to be some limit raising, error/variable disabling, etc to get the secondary cats to read the voltage that high and for those voltages to not be used as the secondary cats normally would. There's some signal conditioning done to those O2 inputs that might be beneficial as well. I'm not sure what the best way to approach this is, just kind of thinking out loud. Sounds like a very viable idea! Not according to Mitchell. Power is pin 1, ground is pin 3 and signal is pin 2. I had to search the site to figure out what you are talking about. I hadn't seen your thread before I started this one, but the concept is the same, just with the trigger being an actual ethanol sensor incorporated into the system rather than relying only on the trims/knock. Any way to get automatic switching would be awesome. I would feel better about throwing an ethanol sensor in the mix though personally. I thought, according to Bentley, Pin 1 was some type of power and pin 3 is ground. Either way though, if there's only one signal wire, then it is carrying a PWM signal and the separation into pulse width (TCCPATS) and period (TCCHATS) are done at a later stage. And we could quite possibly just splice the ethanol sensor straight in. Looks promising! I'm more of a logic guy and don't have a ton of experience with disassembly/low level programming, but do our ECU's even have enough free space to throw in a routine with like 5 different settings that have 5 different maps per setting (assuming each setting utilizes entirely new maps rather than just multiplying a map by a scalar factor)? Yes, there is a TON of unused space. There is a question (at some point) of cpu load and fast path timing, but i doubt these modifications will add that much to either. The PWM output from the Ethanol sensor is a 5V signal. Is the EGT a 12V or 5V signal? Just went and measured -- you (and Mitchell) are absolutely correct. As I understand it, the ES does not output 5v, its pulls the signal to ground. The receiving component needs to have a signal pull up, 5v for example.